Ductal breast carcinoma, the most common breast cancer is not a rapidly developing disease. Many breast cancer deaths will be averted when we understand cellular mechanisms underlying spread and dormancy. We suggest that the description of Nm23 as a tumor suppressor is incomplete since the extracellular role of Nm23 in maintaining extracellular purines has received insufficient attention. Here we describe a basis for thinking differently about the role of Nm23 in breast cancer. Our study of the role of NME genes that encode nucleoside diphosphate kinase (Nm23/NDPKinase) is intended to contribute a basis for thinking differently about breast cancer spread and dormancy for the benefit of patients. Ductal breast carcinoma, the most common breast cancer is not a rapidly developing disease. Approximately 40,000 patients in the US die each year. Breast cancers can survive in a dormant state and grow as metastatic disease in the future even if detected at a relatively early state and managed surgically. Surgery to remove the primary tumor often accelerates relapse [1-5]. Many breast cancer deaths will be averted when we understand cellular mechanisms underlying spread and dormancy. We suggest that the description of Nm23 as a tumor suppressor  is incomplete since the extracellular role of Nm23 in maintaining extracellular purines has received insufficient attention. Since endothelial purinergic receptor stimulation activates VEGF receptor in the absence of VEGF, a mechanistic link between extracellular Nm23, a nucleoside diphosphate kinase (NDPKinase) and angiogenesis is known. 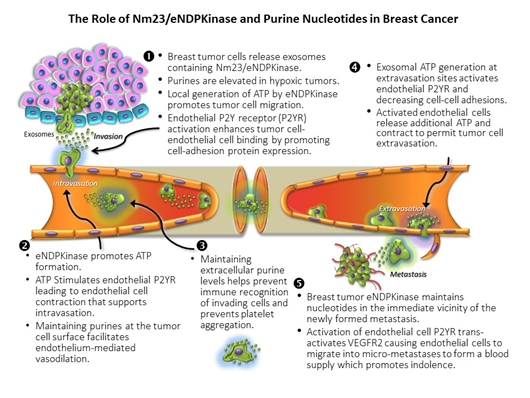 Here we describe a basis for thinking differently about the role of Nm23 in breast cancer. Our approach, focused on the signaling exception represented by the appearance of NDPKinase outside breast cancer cells, brings innovation to the study of breast cancer. We propose a unifying hypothesis to encompass the observation that NDPKinase is elaborated by triple-negative breast tumor cells . Recent evidence from our lab  and others [9,10] that NDPKinase is an exosomal signal suggests that the tumor suppressor and tumor promoter actions of NDPK are compartmented and that signaling evoked by exosomal NDPKinase (eNDPKinase) is mediated by extracellular purine nucleotides (Figure 1). The angiogenic response to P2YR/VEGF receptor signaling we have described with in vitro experimentation  suggests that a combination strategy targeting eNDPKinase could offer a therapeutic choice. Our study of the role of NME genes that encode nucleoside diphosphate kinase (Nm23/NDPKinase) is intended to contribute a basis for thinking differently about breast cancer spread and dormancy for the benefit of patients. NME1 and 2 (aka. NDPK-A and –B) function as NDPKinases regenerating ATP levels by covalently transferring the g-phosphate from a nucleoside triphosphate (NTP) such as GTP, to a nucleoside diphosphate acceptor (NDP; e.g., ADP) effectively maintaining nucleotide levels in the vicinity of the kinase. This is the only known function of circulating NDPKinase , however, intracellular NDPKinase isozymes have been shown to act as a histidine kinase , a transcription activator and an exonuclease . NDPKinase has been discovered in the exosomes of triple negative breast cancer cells and not the poorly metastatic MCF 7 cell . Using directed proteomics, we found that triple-negative MDA-MB-231Luc+ cells elaborate exosomes containing 227 unique proteins including eNDPKinase, while (non-tumorigenic) MCF-12F cells that elaborate exosomes containing 48 proteins, do not contain eNDPKinase . There are ten isoforms of this plurifunctional protein [15,16], only two of which (NDPK-A and -B) are known to appear extracellularly . NDPKinase is distributed in cytosol, mitochondria, plasma membrane and the nucleus . Nm23 was originally described as non-metastatic 23 gene found in mouse carcinoma cells as a homolog of the drosophila awd protein. Gene expression was thought to be inversely related to metastasis potential , although not exclusively [18-20]. Less attention was paid to the enzymatic function of NDPKinase in cancer and metastasis. It is known that cells release extracellular vesicles (EV) containing proteins as well as RNA species (and some even DNA), and that the size, origin and content of these vesicles vary and is disparate between normal and transformed cells . We have shown that NDPKinase appears outside human ductal carcinoma cells  and is angiogenic. Resistance to acceptance of these ideas has been two fold; we could not explain how NDPKinase got out of cells to appear in the blood stream. Moreover, Nm23 was believed to be a tumor suppressor gene , while our data suggested otherwise . The recent focus on EVs [22,24] offers a context for understanding how NDPKinase can be released from cancer cells to act extracellularly. These smallest of the EVs were described in 1981 by Trams, et al. . It is now possible to examine in detail the content of EVs . Exosomes may represent a signaling vector for metastasis [10,22], or even a delivery vehicle for cancer therapy . There is much yet to learn about the nature and function of EVs. Excellent reviews are available [28,29]. We know that exosomes are elaborated by MDA-MB-231 Luc+ cells and that they express numerous proteins including eNDPKinase . There is now evidence to support a role for Nm23 in promoting angiogenesis [7,30]. Addition of conditioned media from breast cancer cell lines known to contain NDPKinase transforms human endothelial cells in culture from monolayers to tubular structures and this is replicated by purified NDPKinase and blocked by inhibitors of NDPKinase. NDPKinase is diagnostic for kidney cancer  and associated with pancreatic cancer  and irritable bowel . By focusing only on correlations between Nm23 gene expression; cellular inactivation, or expression of the mutant enzyme intracellularly with cancer outcomes, we miss the role of exosomal eNDPKinase in predicting the likelihood of progression to indolent disease. Our work showing secretion of eNDPKinase by breast cancer cells as well as its angiogenic action  and the molecular basis of its trans-activation of VEGFR2  has set the stage for understanding its importance as an exosomal signal in angiogenesis leading to tumorigenesis and suggest that NDPKinase may be a survival factor in the metastatic niche. The original description of Nm23-H1 as a tumor suppressor has received considerable attention , but exceptions to this notion have appeared for some time from our lab and others [7,11,34,36-43]. While seemingly contradictory, we suggest that the extracellular actions of Nm23 are distinct from those of overall cellular expression and the intracellular signaling that has been the focus of others . The fact of NDPKinase appearing outside cells is established in vitro and in vivo [45,46]. Published evidence confirms that breast tumor cells release exosomal NDPKinase [8-10]. Amounts of eNDPKinase appearing extracellularly vary from one breast cancer cell type to another, but elaboration is a feature of breast cancer cells, not normal cells . Two isoforms of NDPKinase, -A and -B (products of Nm23-H1 and -2) are elaborated by breast cancer cells . When MBA-MB-231Luc+ cells are maintained in defined conditions in vitro with low serum (Gibco RPMI 1640 0.5% FBS), cells elaborate more eNDPKinase when hypoxic and when stimulated with serum growth factors free of NDPKinase activity (Buxton, unpublished observation). These in vitro studies and those measuring ATP:P2YR - mediated growth stimulation, migration, tubule-like formations and signal transduction  have led us to suggest that NDPKinase is elaborated by breast tumor cells as eNDPKinase in exosomes in women with breast cancer and that this may be one of the mechanisms by which tumor cells move in the blood stream and attract a blood supply in vivo. In the developed world, by the time a woman has developed breast cancer she is most likely to have had some form of treatment including surgery. We have described the observation that excision of a primary tumor can cause tumor metastases to appear shortly thereafter [2-5] as an inconvenient truth . We think it is intellectually displeasing to imagine that cells are "dislodged' during surgery and so think it reasonable to take this as evidence of subclinical distant metastases extant and indolent at the time of loco-regional treatment. This means that changes in cancer cells from quiescent to active growth occurred at some time following surgery. Demicheli et al. examined recurrence of breast cancer in 1173 pre-menopausal women suffering from aggressive breast cancer, who had a mastectomy but no other treatment. These patients showed an early peak in recurrence, with the majority around 18 months post-mastectomy . Thus, recurrence is not only time-dependent. This modal behavior indicates that surgery is somehow an aggravating event for some women and that there is an as yet ill-defined biological process underlying recurrence, with the result becoming clinically apparent approximately 18 months thereafter. There was a second mode of reoccurrence at 60 months; each correlated with larger (18 month peak) or smaller (60 month) primary tumors . Dormancy (latency) prior to surgical removal may be a function of the primary tumor preventing the switch to angiogenesis and tumor growth being made . These data argue that tumor cells present at distant sites at the time of surgery have existed in an indolent state ever since migrating from the site of the primary tumor early in tumor development. Such a conclusion is further supported by the knowledge that early detection of breast cancer does not prevent the later appearance of metastatic disease [49,50]. Indolent cells proliferate only once the anti-angiogenic effects of the primary tumor are removed, and/or have accumulated genetic changes required for emergence from quiescence [47,51]. Learning how cells enter and exit blood vessels and how they are able to maintain themselves in a dormant state prior to progression to metastatic disease offers a rationale for improving breast cancer treatment. Normal cells move into and out of tissue spaces in the processes involved in development and immunity . Tumor cells mimic many of these processes in their passage from primary tumor to metastatic site. The transendothelial migration of white blood cells out of the blood stream and into tissue spaces requires that they move between capillary cells and through basement membrane. This diapedesis or transendothelial migration, is known to involve the interaction of leukocytes with the vessel wall . Intercellular adhesion molecule-1 and vascular cell adhesion molecule cluster on the endothelial cell and appear to be responsible for leukocyte binding based on interaction with specific leukocyte molecules (e.g., CD11, CD18, CD49 and CD29). The steps that follow involve both leukocyte and endothelial cell deformation to permit transit to occur . It is known that locally generated ATP enhances leukocyte binding to endothelium  and that the expression of adhesion molecules by endothelium is enhanced by extracellular ATP acting at purine nucleotide receptors . Moreover, polymorphonuclear leukocytes are known to elaborate ATP extracellularly themselves , so that along with endothelial cells that are well-known to elaborate ATP extracellularly , ATP receptors will be activated and endothelial permeability enhanced [59,60]. Rapid metabolism of ATP locally would generate adenosine consistent with reversing the permeability of the endothelium  and dilating venous vessels to facilitate flow down-stream . Purinergic receptors  (P2YR) are recognized as regulators of carcinogenesis and endothelial cell functions and are modulators of platelet aggregation and blood flow regulation [64,65]. Extracellular ATP and ADP activate endothelial cell P2Y1 receptors to release vasoactive mediators such as nitric oxide, prostacyclin, and additional ATP [58,64] to elicit vasoactive, proliferative and angiogenic effects . Human endothelial P2Y1 receptors transactivate endothelial VEGFR-2, suggesting a direct link between extracellular nucleotide generation and growth factor signaling [11,67] that fits with our hypothesis since in the absence of VEGF, inhibition of NDPKinase will prevent VEGFR-2 activation. A role for eNDPKinase in the process of metastasis is supported by disruption of CD39 (ecto-apyrase; EC3.6.1.5), the dominant vascular ecto-nucleotidase which has been observed to inhibit tumor angiogenesis and metastasis [68,69]. This would lead to decreased ADP levels in capillary vessels and decreased P2YR activation. We propose that eNDPKinase makes the metastatic niche receptive by endothelial activation and predicts the likelihood of progression to indolent disease by supporting dissemination and angiogenesis . Our presentation of eNDPKinase as an exosomal factor by breast cancers in the pathogenesis of breast cancer metastasis offers a testable mechanistic hypothesis that challenges the notion that Nm23 is simply a tumor suppressor inversely correlated with metastasis potential. Our proposal expands the role of Nm23/NDPKinase by addressing its role as an exosomal kinase. Our hypothesis offers a concept of breast cancer biology that may apply broadly to solid tumor metastasis. Research on eNDPKinase may translate to new therapeutic targets in the treatment of human breast cancer. Such research will justify examining the polyphenols as eNDPKinase inhibitors and screening for more potent and specific eNDPKinase inhibitors and testing compounds that are P2YR antagonists to determine the likelihood that exosomal eNDPKinase can predict progression to metastatic disease and that non-toxic eNDPKinase and P2YR blockers can be developed as putative adjuvant supplements for treatment of women before surgery. An intriguing aspect of our hypothesis is the possibility that breast cancer cell elaboration of eNDPKinase containing exosomes may prime the metastatic niche. It may be possible to test whether infusion of exosomes can make poorly metastatic cells survive and trigger more aggressive growth or that mutating the eNDPKinase to inactive kinase in exosomes might prevent or delay metastasis formation. It is possible that the exosome content arrives at the metastatic site in women before tumor cells arrive and that this paves the way for cells to survive in the niche with limited blood supply when they arrive and survive until additional events transform cells further leading to VEGF secretion and rapid growth consistent with escape from dormancy. The ability of NDPKinase to phosphorylate three defined substrates, the β subunit of heterotrimeric G proteins (Gβ), the intermediate conductance potassium channel KCa3.1, and the Ca2+-conducting TRP channel, TRPV5 [70,71], expand the possible importance of the kinase. These findings also suggest that engineering exosomes to deliver anti-angiogenic therapies might be a treatment strategy in women early on in the course of their disease. It is possible that an individualized therapy involving growing cells from a woman’s primary tumor that are engineered to produce exosomes containing anti-angiogenic or other anti-tumor treatment would be a form of individualized therapy worth developing. Schmidt-Kittler O, Ragg T, Daskalakis A, Granzow M, Ahr A, et al. (2003) From latent disseminated cells to overt metastasis: genetic analysis of systemic breast cancer progression. Proceedings of the National Academy of Sciences of the United States of America 100: 7737-7742. Wong S, Speirs K, Duan S, Buxton ILO (2015) MDA-MB-231 Cell Exosomes Contain Nucleoside Diphosphate Kinase. Reproductive Science (T-041): 121a. Yokdang N, Buxton IL (2010) A Role for hNDPK-B in Breast Cancer Metastasis in vivo. In: Proceedings of the 101st Annual Meeting, American Association of Cancer Research Tumor Biology (LB-366): 467. Foundation Professor & Chair, Pharmacology, Department of Pharmacology, University of Nevada School of Medicine, 1664 N. Virginia Street Reno, NV 89557-0318, USA.